This post explains how a vague and unsubstantiated statement in a non-peer reviewed “report” about climate change and agriculture in Maghreb countries made its way via a poor translation into volume 2 of AR4 (IPCC 4th Assessment Report), from there into the summary for policy makers where it eventually became almost certain (i.e. it got a double star, or “high confidence” rating). The reports of the Intergovernmental Panel on Climate Change (IPCC), including the recent (2007) 4th Assessment Report (AR4) have become the ultimate reference in matters of climate. Although the acronym IPCC includes the words climate change, the scope of their reports is much broader and extends well beyond “change”. It includes also current variability and even some statements about the future of our societies as a whole, through the discussion about emission scenarios. Such emission scenarios eventually depend on fundamental options that our countries will adopt in he ambit of their environmental and global policy options. Under the guidance of some leading climatologists, we have gradually come to realise that climate is One, and that our survival depends on it. Recently, however, some cracks have appeared in the consensus that all criticism of IPCC was, by definition, “unscientific” or driven by undisclosable motivation. I have mentioned the fundamentalist drift of IPCC on several occasions in this blog, for instance here or in the post about How difficult it is to be a climatologist. The cracks started with the Climategate, which is described in the previous link.An interesting discussion on consensus science was recently published by Daniel Sarewitz in Nature. It is now becoming evident that IPCC reports are not fool proof and that, intentionally or not, basic scientific precautions have been ignored… not to mention bad manners (magister dixit…). 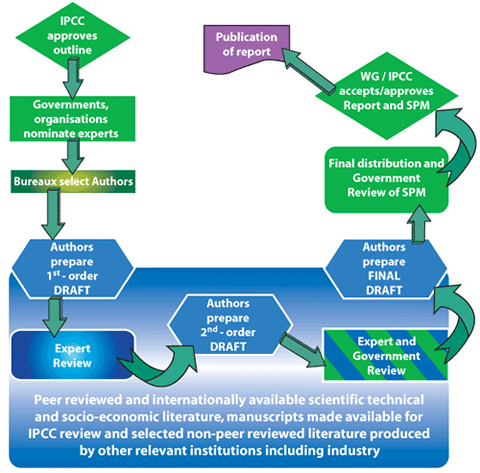 At least partially, the problems come from the fact that the IPCC and UNFCC processes are a rather complex and sometimes explosive mix of science and politics, as mentioned above. Let us take an example which I will illustrate below, based on the AR4 Working Group II (WG2) on “Impacts, Adaptation and Vulnerability” (IPCC has 3 working groups: WG1 on “The physical science basis”, known in short as “Science”; WG2, referred to as “Adaptation” and WG3 on “Mitigation of climate change”, known as “Mitigation”). They can all be downloaded from the IPCC website (http://www.ipcc.ch): Science, Adaptation and Mitigation. Each chapter in the AR was prepared using a complex ritual by a large number of authors, starting with Coordinating Lead Authors (CLA), Lead Authors (LA) and Contributing Authors (CA), plus Review Editors. IPCC tries to maintain a very orthodox balance of continental and gender representation among its various categories of authors. Here is an example from AR4,2:1 (WG2 Chapter 1): the percentage of women is 37% and the representation of continents varies from 4% (Africa) to 26% (North America) to 48% (Europe), with the other continents (Latin and Central America, Oceania and Asia varying between 6 and 9%. In chapter 9 (Africa) , the percentage of women among authors is 30%. The effort to involve women is remarkable, but the reality remains, however, that some regions just don’t have enough experts of the right subject and the right gender, with the result that the actual work is done by a limited number of lead experts with virtual inputs by others. Each WG report has a Summary for Policy Makers (SPM), which is what most people read. This also an easy entry point for trouble, as the SPMs are approved in plenary meetings where all countries have to agree. This is called “science by consensus” which is about the most unscientific approach one can think of, as many simplifications must take place for a mixed audience of experts and non experts to reach consensus on a watered-down scientific text. WG2 SPM, for instance, included the following sentence on their first page: This summary, approved in detail at the Eighth Session of IPCC Working Group II (Brussels, Belgium, 2-5 April 2007), represents the formally agreed statement of the IPCC concerning the sensitivity, adaptive capacity and vulnerability of natural and human systems to climate change, and the potential consequences of climate change. In other words: you’d better note this is “officially approved” stuff. The first pages of each volume also mention how the full report should be quoted as, for instance IPCC, 2007: Summary for Policy-makers. In: Climate Change 2007:Impacts, Adaptation and Vulnerability. Contribution of Working Group II to the Fourth Assessment Report of the Intergovernmental Panel on Climate Change, M.L. Parry, O.F. Canziani, J.P. Palutikof, P.J. van der Linden and C.E. Hanson, Eds., Cambridge University Press, Cambridge, UK, 7-22. Let me present a real world example of what can happen to text as it moves from an original publication/report into a chapter of a WG, then into the SPM and eventually into other websites, publications, media people and others. I was directly involved in the preparation of a joint 2009 meeting between the World Meteorological Organization (WMO), the Food Agriculture Organization (FAO), the State Agency for Meteorology of Spain (AEMET), the African Development Bank (AfDB), the Economic Community of West African States (ECOWAS), the International Crops Research Institute for the Semi-Arid Tropics (ICRISAT), the International Livestock Research Institute (ILRI) and the General Directorate of Civil Aviation and Meteorology of the Government of Burkina Faso. The meeting produced a joint statement, that was, as is customary, drafted before the meeting, then discussed and formally adopted. The document is available from here. The document includes this statement: in some countries, yields from rainfed agriculture could be reduced by up to 50 per cent by 2020 thereby threatening the food security and other aspects of the Millennium Development Goals (MDGs). This statement is wrong. My common sense and experience with crop-weather relations in Africa (and elsewhere) tells me that a reduction of yields by 50% at the national level in just ten years is wrong. Severe reductions can happen at a very local scale (e.g. a village or, maybe, a district), but not at the country level. I also don’t think climate could change so drastically in just ten years as to result in the loss of 50% of yields. I made the points in the drafting phase of the document, and the reaction was : this comes from AR4, it cannot be questioned. I brought up the issue again during the meeting that produced the report, and I had the room and WMO against me: this comes from IPCC, i.e. this is beyond discussion. reduced by “up to 50%”. The original statement comes from page 13 of AR4 WG2 SPM and the precise text is In some countries, yields from rain-fed agriculture could be reduced by up to 50% by 2020 followed by ** N [9.2, 9.4, 9.6]. The two asterisks indicate that the reality of the statement can be accepted with “high confidence”, i.e. it has “about 8 out of 10 chance” of being correct, while the N informs readers that the statement is new, i.e. it was not contained in TAR, the Third Assessment Report. Finally [9.2, 9.4, 9.6] points to the sub-chapters where more information is available. Let us now go to the summary of chapter 9, page 435, where we read that Projected reductions in yield in some countries could be as much as 50% by 2020, and crop net revenues could fall by as much as 90% by 2100, with small-scale farmers being the most affected. This would adversely affect food security in the continent. [9.2.1, 9.4.4, 9.6.1]. The exact original quote is on page 448 (under 9.4.4): […] Southern Africa would be likely to experience notable reductions in maize production under possible increased ENSO conditions (Stige et al., 2006). In other countries, additional risks that could be exacerbated by climate change include greater erosion, deficiencies in yields from rain-fed agriculture of up to 50% during the 2000-2020 period, and reductions in crop growth period […] (Agoumi, 2003). What this means is that the statement does not refer to Southern Africa but to “other”, i.e. non-southern-African countries. We are also told that it is the combination of climate change with three other factors that will an additional factor of risk. Those factors are soil loss (erosion), a shortening of the length of the growing period and deficiencies in yields from rain-fed agriculture of up to 50% during the 2000-2020 period. The wording is not too transparent; in particular “deficiencies in yields” does not have any precise meaning. Whatever the meaning, I also note that the loss of 50% could happen over 20 years, between 2000 and 2020. Fortunately, we have just been informed that the original source is Agoumi, 2003. The document is easy to find on the web. 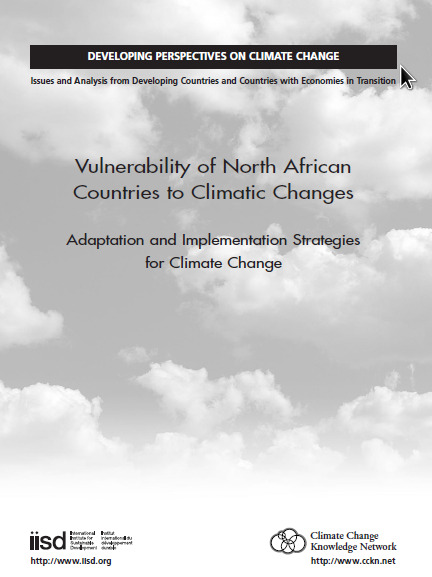 The title of the 14-page report is Vulnerability of North African countries to climatic changes: adaptation and implementation strategies for climatic change. Developing Perspectives on Climate Change: Issues and Analysis from Developing Countries and Countries with Economies in Transition. And it is published jointly by IISD and Climate Change Knowledge Network. Interestingly, the publication is an ad hoc report, a “technical paper” that was never peer-reviewed. It is about North Africa, a point never mentioned in the IPCC reports either. This is very important, though, because the Mediterranean region is indeed projected to be among the areas that should undergo marked reductions in rainfall. It is, however, correct that North African countries are African countries! 1. Une érosion plus forte entraînant une grande dégradation des sols. 2. Des déficits de rendements des cultures pluviales pouvant atteindre jusqu’à 50 % durant la période 2000–2020. 3. Une réduction de la durée végétative des cultures. etc. 3. A shortening of the cycle length of crops. It is not clear why Agoumi mentions these climatic changes, neither in the French nor in the English versions. There is strong soil erosion with extensive soil degradation. Decreasing rain-based agricultural yields with grain yields reduced by up to 50 per cent in periods of drought. Which means that grain (crop) yields may drop 50% during a drought year in comparison with an average or “normal” year. This statement is no-doubt correct, and it may be the text that eventually led by over-simplification to the “famous” quote that started the present discussion. However, no matter how this non-peer reviewed report is read, it provides no evidence and no references confirming that there exists a country in Africa where average national yields would drop by as much as 50% by 2020 (compared with 2000). Since Agoumi deals with North Africa, based on a recent well documented Moroccan study (and non peer reviewed either! ), I would suggest that the worst case scenario for any crop and any agroecological zone in Morocco projects a reduction of about 10% compared with the current baseline by 2030. Not only: 2020 is a period for which downscaled scenarios are very unreliable and our Morocco study had to struggle with increased rainfall projections for 2020! Many of us also remember the WCC3 presentation by Mojib Latif where he mentioned temporary cooling (see his 3rd slide) and predicted a lot of … unpredictability for the next decade. To conclude, I would like to come back to the original AR4 SPM2 statement: In some countries, yields from rain-fed agriculture could be reduced by up to 50% by 2020. I do understand why it is followed by N, but I cannot figure out how it could possibly be assigned the generous ** rating! In the wake of the Climategate, IPCC has come under well deserved heavy fire from many quarters. I am saying well deserved because science should remain science, and it is good that the public and – hopefully – politicians should realise that the ARs are not inspired holy scriptures. They are affected by a number of deficiencies (especially in the SPMs), abnormally inflated egos and intellectual terrorism, as many a honest scientist has noted in disgust long ago (read this!). But no one can contest that climatology has made enormous progress over the last twenty years and that, in spite of deficiencies, the ARs remain a beautiful synthesis of the subject. Let us hope that the Climategate will bring back science, with its contradictions and uncertainties! After the great spring clean-up, the image of IPCC will improve; maybe politicians will understand that climate fundamentalism and opportunism do not pay, in the long run. 1. Ce qui me frappe, c’est d’abord le diagramme: le rectangle “Expert and Government Review” ruine tout l’édifice “scientifique”, c’est le talon d’Achille le plus flagrant du système. Une fois que l’on met les gouvernements dans le jeu en amont au niveau scientifique, il est impossible de ne pas avoir une dimension politique. On la retrouve d’ailleurs, mais sans doute à un degré moindre au niveau des nominations d’experts, etc. Il faudrait dans l’idéal séparer les deux, mais dans un processus onusien, “club d’Etats”, est-ce même envisageable? 2. La deuxième, on oublie trop souvent que les scientifiques ne sont que des humains, avec tous les travers du commun des mortels contrairement à ce que laissait entendre Descartes. Lorsque l’on associe ce fait à celui que les catastrophes et les chiens écrasés font vendre, on crée une dynamique à la quelle peu de Galilée ont le courage de dire eppur si muove et cela d’autant plus que le nombre de scientifiques impliqués dans le IPCC est énorme, ce qui finit par créer une doxa qui dérive facilement vers un dogme et les hérétiques au bûcher! Entre parenthèses, le Président de la réunion qui opposait la vérité d’un document a failli à son devoir car il aurait dû à ta suite signaler la faiblesse du document à qui de droit au lieu de la soutenir. 3. La troisième chose qui frappe est la complexité du système: il y a tellement de niveaux et d’étapes afin d’assurer la qualité scientifique que c’est “self defeating” et l’on sait que plus il y a de contrôles et plus l’irresponsabilité et les manipulations peuvent augmenter. Des auteurs comme Jared Diamond dans Collapse ou Joseph Tainter dans The Collapse of Complex Societies, soulignent les dangers de l’hyper complexité. Il me semble que le IPCC fait face à des problèmes inhérents à son organisation. Il est même étonnant qu’il n’en ait pas rencontré de plus sérieux! Quelle est alors la solution? A titre d’illustration pour le troisième point -dans un domaine complètement différent -je donne ci-dessous deux extraits d’un chapitre que j’ai écrit pour un ouvrage de l’INED intitulé Du Genre et de l’Afrique. Je crois que je t’avais déjà envoyé ce papier, mais mes remarques prennent un autre relief dans le cadre de cette discussion sur les problèmes du IPCC. [Extrait de l’Introduction] Cette visite guidée a pour toile de fond un recoin des Nations unies, cette institution, tantôt traité de « machin », tantôt portée au pinacle, suivant les besoins du moment de la real Politik. En effet, ce club d’Etats est en fait l’arène où se confrontent non seulement les égoïsmes nationaux, mais aussi des idées, des doctrines, des lobby et des ambitions de toutes sortes. C’est une jungle où les sujets ne peuvent s’imposer de par leur seule importance intrinsèque car celle-ci n’a pas de sens dans une arène où priment le politique et la géostratégie. Ainsi, pour y introduire une problématique comme « femme et sida » il ne suffit pas d’arguer sur le fond, le concept, la méthode : la réussite dépend surtout de l’habileté de ses promoteurs à jongler entre contraintes techniques, politiques ou bureaucratiques et disponibilité de ressources. La voie est, par nature tortueuse. La visite à laquelle je convie le lecteur se déroule sur deux plans séparés, l’un, théorique et l’autre, politique en interaction constante. [Extrait de la Conclusion] Aussi pertinente et intéressante qu’elle soit, une question n’est jamais traitée sur la scène internationale qu’en fonction des enjeux politiques et socio-économiques non seulement des États, mais aussi d’autres groupes d’intérêt. En l’absence de déclarations officielles, on ne peut qu’avancer des hypothèses sur le démarrage rapide de la question femme et sida, puis sur la façon dont elle a été évacuée (provisoirement). Il est clair que l’approche développée par la DAW ne convenait pas à tous car elle dépassait le cadre des droits de l’homme en touchant à la problématique du développement, modifiant ainsi le centre de gravité de la question femme et sida. Ceci aurait probablement pu être négocié avec le temps, mais lorsque la réflexion en vint au concept de genre, la remise en cause devenait trop radicale pour être acceptée. Ainsi, les Nations unies étant un miroir des États et l’interprétation de femme et sida un miroir des sociétés, la question se trouvait piégée par un double jeu de miroirs se reflétant l’un l’autre. 4.Dans le même ordre d’idées: te souviens-tu lorsque nous préparions notre immortel papier sur l’impact possible de la montée du niveau des océans, on s’est heurté à l’affirmation que les deux tiers (?) des habitants habitaient près de la mer… Les heureux vacanciers. On ne trouvait pas la source de cette affirmation… Si mes souvenirs sont exacts, c’est Freddy qui a découvert que c’était un participant à une réunion qui avait fait une estimation pifométrique… qui a été reprise sans la moindre question devenant de plus en plus vraie à chaque répétition!